On Friday, March 1, the Education Committee will hold a public hearing regarding several proposals concerning school regionalization. I've spent the last few weeks speaking out against any proposal that would force schools to regionalize. Click here to read my recent op-ed on the topic (excerpted below). The schools in our district are some of the highest-performing in the state. We make sure we’re efficient in having the right services and staff to suit our students, with little funding from state government. As a proud graduate of our public schools, let me be clear: I will continue to actively oppose any measure that would force schools in the 26th District to regionalize. When I disagree with members of my own party, I’m never afraid to say so and I didn’t hesitate to speak out against a broad-brush regionalism proposal introduced by a leader of my own party. As this is a topic that has drawn significant attention, interest and concern for my constituents and across the state, I want to provide information on how members of the public can testify in Hartford or online. Everyone deserves to make their voice heard, especially on a topic as important as our education system. 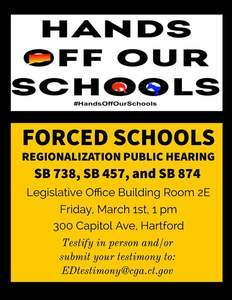 I will be in Hartford on Friday to testify against forced regionalization and I hope you'll join me. The Education Committee public hearing is scheduled to start at 1 p.m. in Room 2E of the Legislative Office Building, or LOB, located at 300 Capitol Ave. in Hartford. Sign-ups to speak at the public hearing will be open from 10 a.m. to noon in the LOB lobby. For the first hour of testimony, commissioners, first selectmen, legislators, mayors and constitutional officers testify. After the first hour concludes, they alternate with members of the public. To submit written testimony, lead the document with the Senate bill numbers you are discussing and include your name and town. Attach the document to an email with the bill numbers in the subject line and email it to the above address before the deadline. All testimony is recorded for all legislators on the committee, who may be unable to attend the full hearing. Please remain civil and respectful while writing or speaking your testimony. Your viewpoint is important, as are the views of others speaking. To reach the LOB, head toward 300 Capitol Ave. in Hartford and follow an access road around the building until you reach the parking garage. You can park wherever there is space available, and if the garage is full, overflow lots are available nearby. The public entrance to the LOB is located on the west side., and after passing through security, you will be in the lobby. There are restrooms on each floor and cafeterias on the first and third floors. Please contact me if you have any questions at www.senatedems.ct.gov/haskell or 1-800-842-1420. I look forward to hearing from you.